Magaluf is located in the southwest corner of Mallorca, seven kilometres from Calvià. Magaluf has many British visitors, but also many (young) tourists from Scandinavia. One of the most popular hotels for young people is the adults-only hotel BH Mallorca, which is within walking distance from the bars and discos and the beach. 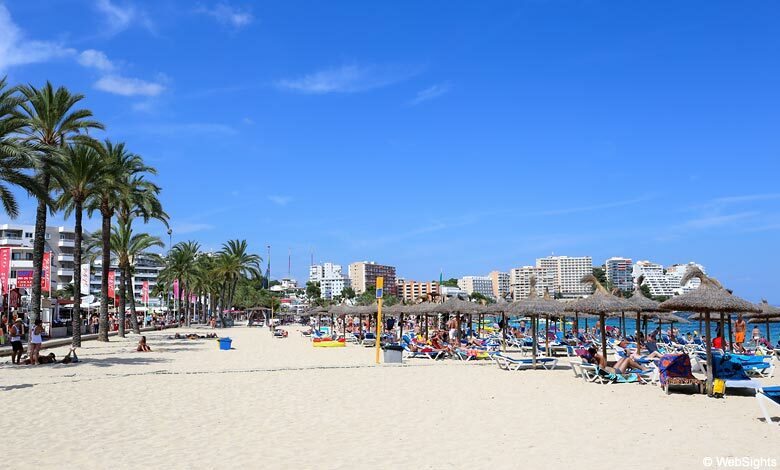 Magaluf has a lovely 900 m long beach with the official name Platja de Magaluf. The beach has fine-grained sand and clear water. During the summer, there are many young people at the beach in Magaluf, and naturally, this influences the beach life. The beach has all facilities, including sun lounges, sunshades, toilet, showers and lifeguards. Behind the beach, there is a lovely new sea front, and here the young people gather in the afternoon. The beach itself is child-friendly, but Magaluf is not a good holiday resort for families with children. It is basically a party town for young people – and this also affects the beach. On the water, anything is possible in Magaluf and there are plenty of activities going on! If you prefer water skis, jet skis, banana boat or parasailing, Magaluf is just the place. Behind the lovely sea front, there is a wide variety of restaurants and bars. Magaluf has about 100 bars, discos and clubs and is known as the ultimate party town in Mallorca. The biggest night club is the legendary BCM Planet Dance, but there are many others. So if you seek a festive and wild nightlife, Magaluf is perfect! However, the party season is only during the summer. The rest of the year, Magaluf is a relatively quiet town with a majority of older tourists during the winter. The biggest attractions in Magaluf are the giant water park Western Water Park and the biggest show in Mallorca: The Pirates Show with dancing and acrobatics. The map shows Magaluf beach and the most of the town. If the map is moved a bit further to the north, you will see the three beaches in Palma Nova. Further to the west, you will see Santa Ponsa.